Like I mentioned before, my little one’s first birthday is fast approaching. I’ve been up early multi-tasking like a mad person every morning. I kid you not, I had no idea I can do so many projects at one time! We had a one year photo shoot on Friday so I was up early Friday morning trying to finish everything last minute – I thought I was going to have a melt down. 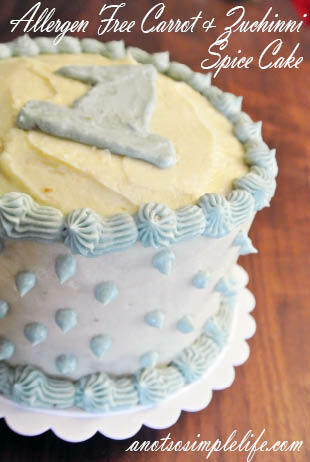 Oddly though, every single thing I did in my panicked rush turned out perfect, from my Maritime Flag Birthday Banner backdrop, to the Allergen Free Birthday Cake and Natural Blue Food Coloring – I really couldn’t believe it. Check out the blog in about a week for posts on how you can make your own nautical decor and food coloring. 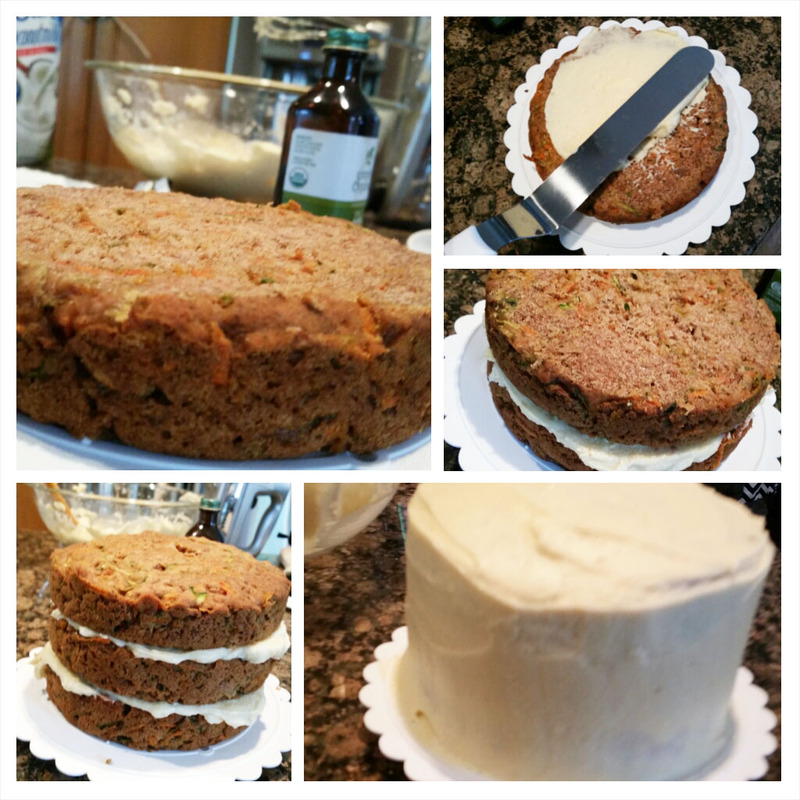 For now, here’s a really delicious gluten free, dairy free, soy free, nut free, corn free, egg free Carrot-Zucchini Spice Cake recipe. This recipe is modified from Nomyumfree.com’s Harvest Cake recipe (which she also used for her little one’s first birthday!) You can check out her post here. Shred your zucchini and carrots. Place the shredded veggies between a few paper towel and squeeze to remove the moisture, repeat 2-3 times. Preheat the oven to 350 degrees and spray your cake pans with cooking spray. In a small bowl, mix chia seeds with water and let set until thickened (about 2 minutes). In a medium bowl combine flour, baking soda, baking powder, cinnamon, nutmeg, cloves, and all spice. Add canola oil to the chia seed mixture and beat with an electric mixer for about 1 minute. Add sugar and continue to beat on low. 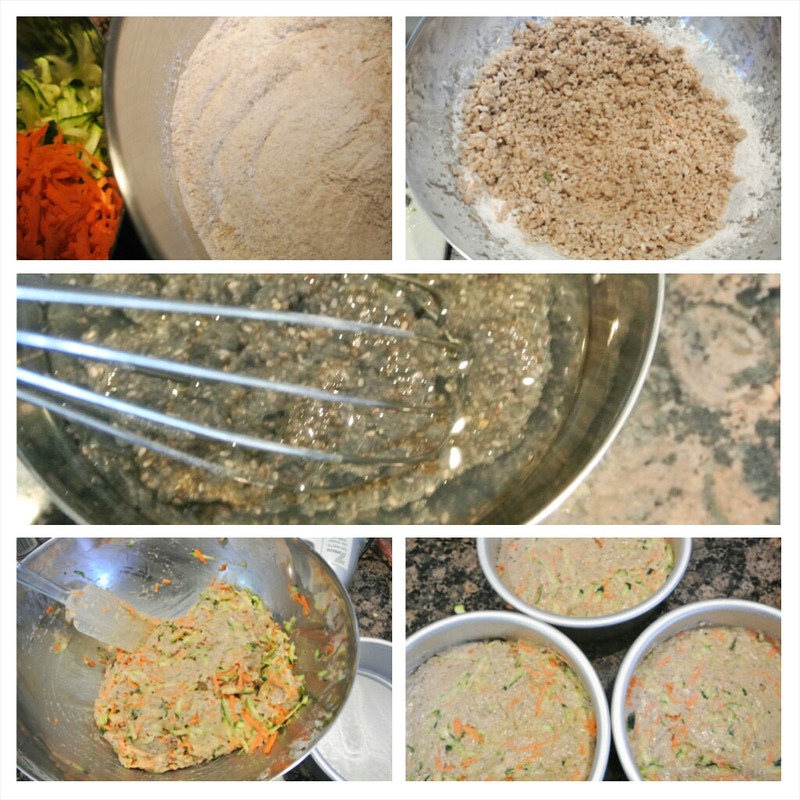 Fold in carrots and zucchini. 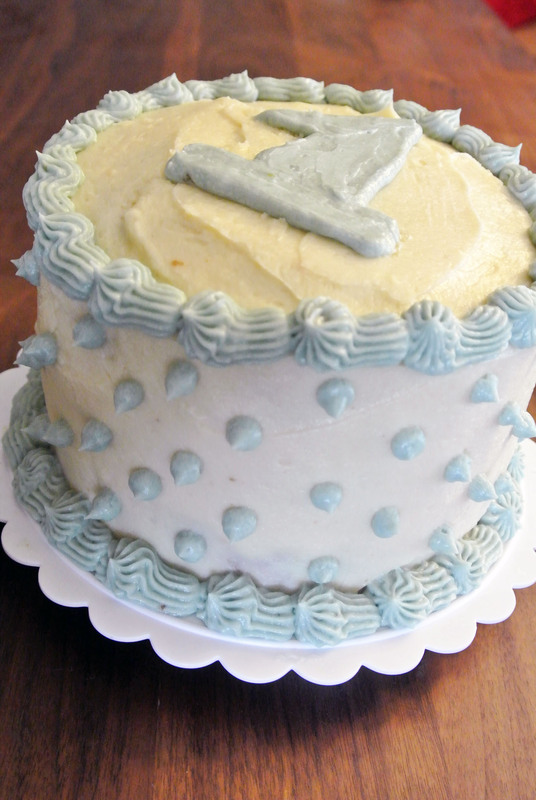 Frost with your favorite allergen free frosting! I personally LOVE a nice butter cream! Although we’re dairy free we can have butter (because we’re technically whey free). I’ll post more on that later! All of my recipes are gluten free, soy free, dairy free, and nut free, meaning that they are peanut free, cashew free, tree nut free, walnut free, pecan free, and almond free. They are also free of a lot of other grains and legumes because I’m intolerant to them, along with gluten. My recipes are amaranth free, barley free, chick pea free, buckwheat free, fava bean free, flax free, garbanzo free, oat free, rye free, sorghum free, spelt free, and teff free. If there are easy substitutions to make the recipe egg free I try to include them. My recipes are dairy free – I personally am intolerant to whey and therefore can eat butter. Mostrecipes can be made completely dairy free with a butter substitute. Feel free to leave any changes you’ve made in the comments for others to see! I’m so happy you liked it! Yum! I would love to hear how the coconut cream frosting turns out! Hi! I’ve never made it with anything other than applesauce. Do you need to avoid apples? If so, you could try mashed bananas or even canned pumpkin. I bet they would both be delicious. If you make it with either let me know how it goes! Is there something I could use instead of canola oil? I’m totally going to use your buttercream frosting recipe – all looks so yummy! Hello! Yes, you could use any type of oil. We’ve moved away from canola since this time and use avocado oil for almost everything now. Coconut oil would work fine too! The buttercream is delicious and rich (as frosting should be) without the weird shortening oily coat your mouth feeling! Note that butter is dairy (as Im sure you know) so make sure your little one can tolerate it. We’re dairy free but can tolerate butter. I will try the coconut oil substitute next time. The flavor turned out good (I used one of my daughter’s beet/apple organic pouches in lieu of the applesauce). However, even after baking for 22 minutes, in two small tins (I only used about 1/3 the recipe this time) the center’s of my cake were still pure dough! Perhaps I didn’t dry my veggies enough? Any ideas to help? I don’t want to over bake. I love all the ratios though, it was perfect around the edges where it was cooked! Hmmmm, I’ve never had that happen. My thought is that maybe the beet/apple is more watery than apple sauce (if I remember those correctly). Maybe decrease the sauce slightly? I could also see it being teh veggies if you didn’t get enough water out. Hope it works for you!